Saving basil seed. Plus: To freeze or not to freeze? Thai basil going to seed - a treat for bees! In this Episode 9 outtake, Colleen Dieter talks about saving seed from basil plants. Basils are a bit of a special case because flowering affects the taste of the leaves. When flowers start emerging, the leaves will acquire a more bitter taste. As eaters of basil, we don’t want that; which is why it’s recommended to “pinch” the tops of basil plants (pluck off the flower buds before they open) to prevent them from flowering. Of course, if you want to save seed from your basil — and why not, it’s so easy to grow from seed — you’ll have to let it flower. So you have a few options: you can either plant two basils, and designate one for seed production, OR stop pinching your basil toward the end of the season (let’s say, around Halloween in Central Texas) so that seed can fully mature on the plant well advance of a freeze. Seed should be saved from stalks that are fully dry and brown and stored in a cool, dry location. Colleen explains how to harvest the seed and gives us yet another option — let your basil reseed freely and see where it decides to come up on its own next year! To freeze or not to freeze? For a few years now, I’ve been putting seeds in the fridge or the freezer indiscriminately without thinking much about it. After all, seed banks do it; why not home gardeners? 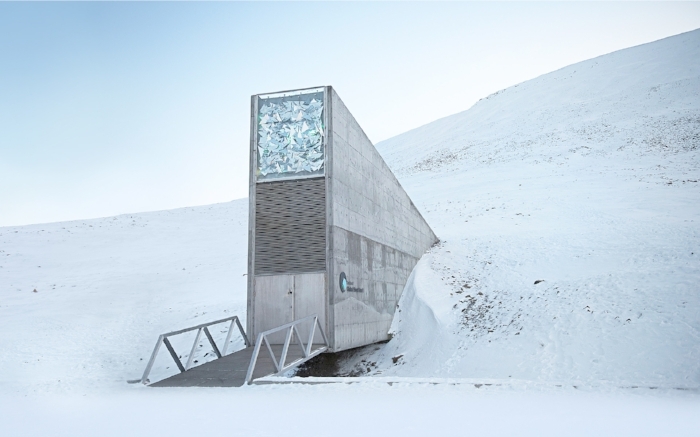 The Svalbard Global Seed Vault is a secure seed bank on the very cold Norwegian island of Spitsbergen. “You can absolutely freeze seed IF they are completely and totally dry, and in glass jars or some other non-gas-permeable container. I keep mine in canning jars and wire-bail-lid canisters. The enemies of seeds are fluctuations in moisture and temperature. Too much of either and the seeds will die. The freezer stops fluctuations in temp, and the glass stops fluctuations in moisture. (That's what freezer burn is - "freeze-drying" from moisture having been pulled out of the food.) So yes, even for the home seed saver, freezing seeds is absolutely the best way to preserve them. That's why the Svalbard vault is where it is! Way the hell up north. Saturday, September 29th at 10 am – Linda Wall teaches us all about “Basic Seed-Saving for the Vegetable Gardener.” Gardeners and farmers have been saving seeds and doing their own plant breeding long before we had commercial seed companies. When we correctly save our own home grown vegetable seeds over time, we get varieties that are uniquely well-adapted to our specific site – and our palates! Come and learn how to save your own vegetable seeds to save money, preserve genetic diversity, and ensure you’ll never be without that favorite vegetable variety. Hothouse mentioned in the UK's Garden Design Journal!